Musea’s: Amsterdam is an incredibly culturally rich city. At every turn, you will find historic architecture, inspiring galleries and fascination museums. Plunge in to Amsterdam’s museum culture by starting with this handy guide to some of the best exhibitions and artefacts in the city. One of the city’s most beloved museums focuses on the life and works of perhaps its most famous artistic denizen: Vincent Van Gogh. The Van Gogh Museum is also located close by to the Rijksmuseum which is one of the largest museums in the city, and which is home to a wealth of amazing exhibits including some coveted paintings by Old Masters that you quite simply have to see in order to believe their full splendour. Lovers of all things science and tech should head straight down to the NEMO Science Centre: you cannot miss its turtle green building, and inside you can see all kinds of weird and wonderful devices, from high powered vacuum cleaners to early computers. No visit to Amsterdam’s museums would be complete without a visit paid to the Anne Frank House. This poignant and very important building contains the hidden room where Anne Frank hid, and visitors are encouraged to enter the concealed compartments to appreciate just how small the space was in which this amazing young woman wrote what is perhaps the most significant diary of all time. This was just a small taster of all the wonderful museums available in Amsterdam: there is so much more to discover in this gorgeous city. As such, it is a good idea to find comfortable, affordable central accommodation so that you can reach all of the museums with ease. 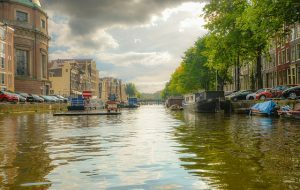 The Amsterdam Hostel Sarphati is an excellent choice in this regard, and it will be the perfect base from which to strike out and explore the city – whether by bike, on foot or using public transport.